The classic “arrrrr” noise that accompanies pirate-speak in movies is thought to have its origins in the 1950s version of Treasure Island. Actor Robert Newton played a particularly memorable pirate character, Silver. He later popularly reprised the role in sequels and on TV. 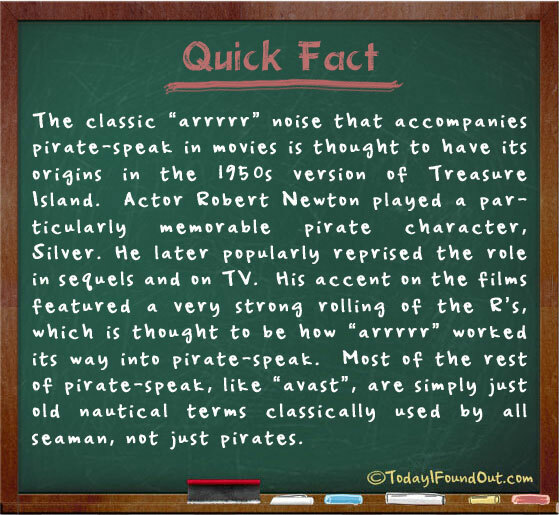 His accent on the films featured a very strong rolling of the R’s, which is thought to be how “arrrrr” worked its way into pirate-speak. Most of the rest of pirate-speak, like “avast”, are simply just old nautical terms classically used by all seaman, not just pirates. The word “freebooter” (another word for pirate), comes from the Dutch word vrijbuiter. Which was a pirate who could sell his “loot” freely. Also, Many of the old naval terms like “deck” (dek), “avast” (Houd Vast), and “ahoy” (Hoi) originally come from the Dutch Navy in the 17th Century. There is a great page on wikipedia about English Naval Words of Dutch origin. The “arrrrr” noise is not so different from how a lot of American and Canadian people pronounce the letter r. In their accents, that letter is normally very heavily stressed.